Many people choose to vacation on white sandy beaches and under hot tropical sunshine. Some people choose cold weather vacations for skiing. 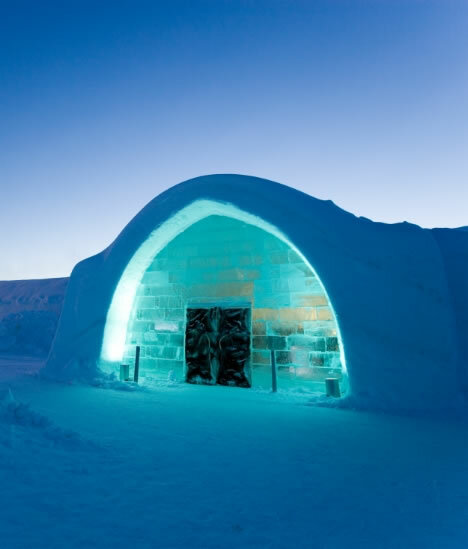 For something really different, a person might try a visit to a hotel built of ice and snow in a land of Northern Lights and the Midnight Sun. 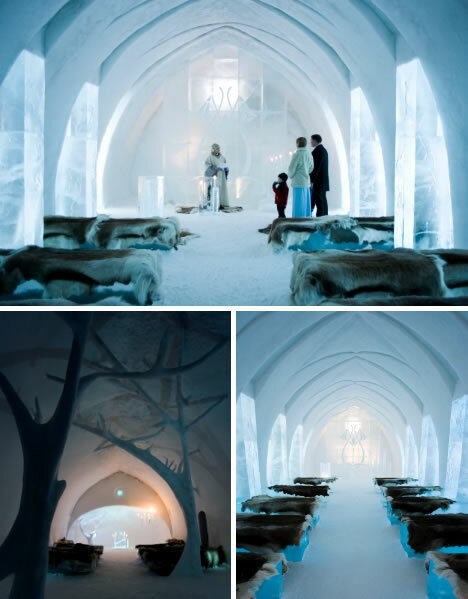 The ICEHOTEL is located 124 miles north of the Arctic Circle in the small village Jukkasjärvi that has only 1,000 inhabitants. There are 32 artist suites created, so you can choose to stay, to snuggle with your significant other, within the ICEHOTEL. Here is a look at some of those artists and artistic suites for a vacation unlike any other. 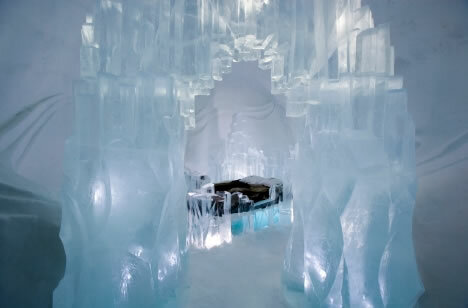 The ICEHOTEL never stands still, shifting from frozen solid to a free flowing river, and back, during a year. It begins as crystal clear ice harvested from the Torne River in March. 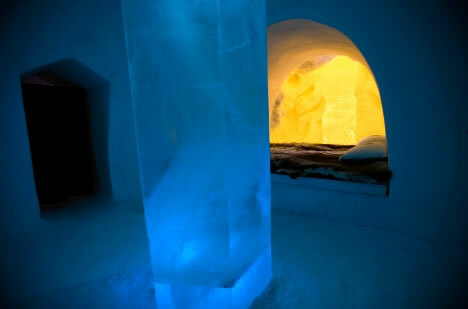 Artists carve these 2 ton ice blocks into sculptures and a hotel. Created with imagination and hard work, the art is temporary, only to melt away under the unforgiving rays of the sun come springtime. 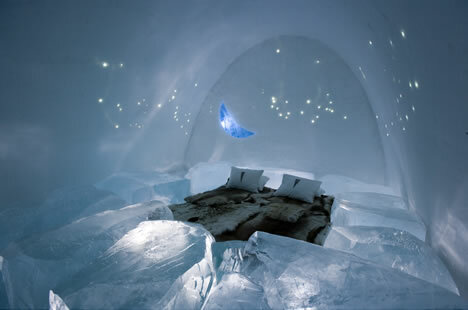 There are 32 different artist suites to choose from within the unique ICEHOTEL. 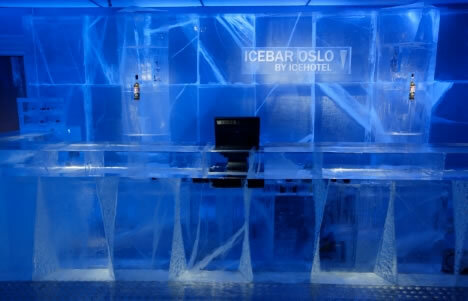 There is also a famous Icebar as well as several other specific rooms like the projection room on the right. 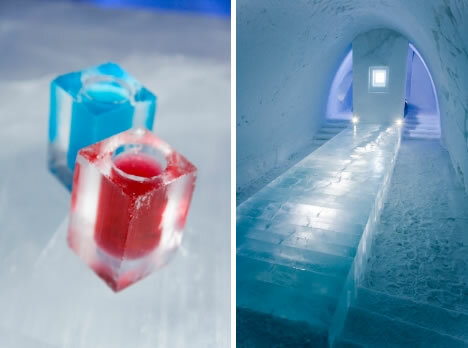 On the left are the famous “glasses” made from ice to hold the drinks served at the Icebar. Artists from all over the world gather in this small Swedish village north of the Arctic Circle to create an exclusive art exhibition: ICEHOTEL. This is the Ice Church. Couples marry here. The Netherlands artists responsible for the Ice Church are Marjolein Vonk, Cindy Berg, Marinus Vroom, Jan Willem van der Shoot, and Maarten Meijer. This art suite is called “Get Bad.” It is only one of many suites and is described as, “Sneak a peek into this enticing, magical spa, where relaxed bathers enjoy the fruits of each other’s company.” It was created by Benny Ekman of Sweden. “Get Bad” is his fourth ICEHOTEL suite. The radiant glow of “Iceplosion” will protect you from the biting arctic cold – bathe yourself and recharge in this rejuvenating shower of warmth and light. Sunglasses are highly recommended. The artists responsible are Rashid Sagadeev of Russia and Charly Walter of Austria. 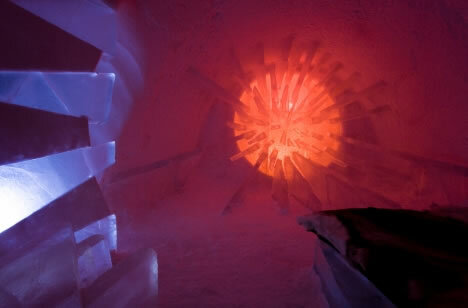 “Iceplosion” is Rashid’s fifth ICEHOTEL suite, Charley’s second. Leave the Earth behind and ascend into “Ho-Shi To Tsu-Ki,” a suite that pays humble tribute to the splendor of the stars and the majesty of the moon. 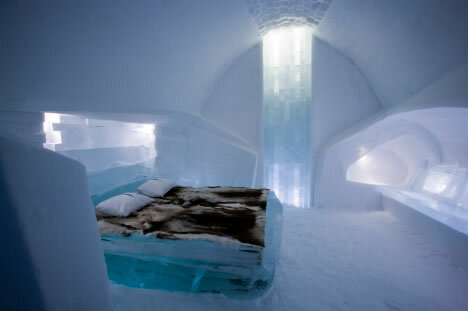 This is the seventh ICEHOTEL suite created by Hiroyoshi Sakai of Japan. Inhale as you experience the expansive nature of “Dynamic Shelter” and exhale as the focus of the room narrows and draws you to a bed of clarity and warmth. 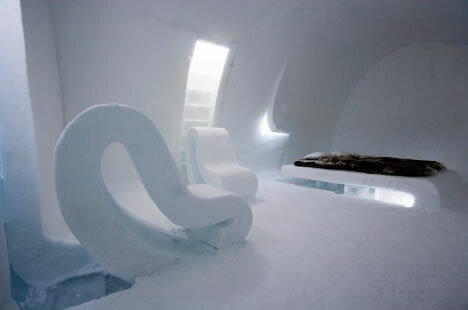 This is the first ICEHOTEL suite for both Chilean artists Javier Opazo and José Vázquez Toro. Experience a chilly version of one of mankind’s most celebrated themes in “Memories of Paradise,” where the ice apples are plenty and ripe for the picking. “Memories of Paradise” is the first ICEHOTEL suite for both artists, Natalia Chistyakova of Russian and Karlis Ile of Latvia. This is the “Peeled Suite” which was created by Charlotte Koster and Michiel van der Boom, both from the Netherlands. Simple, smooth shapes of peeled snow reveal ice that radiates light into the room, casting nuances of brightness across cleanly sculpted surfaces. This suite is “Chasing Penguins.” As we chase a life of ease – Does every one of us have all we need? Ice of blue and ocean clean – Chase that penguin, submarine. It was created by Mark Armstrong from England. 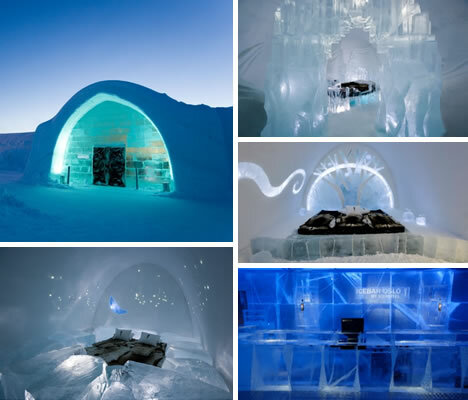 Armstrong has been working with ICEHOTEL for over ten years. 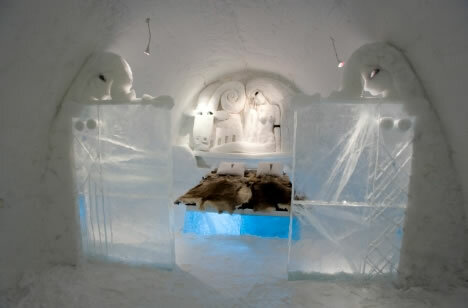 He also has contributed to the construction and design of Icebars that are springing up in several locations worldwide. “The Queen of Ice” surrounds herself with magnificent winter luxury in a palace that captures the beauty of winter. You are respectfully invited to join her. It was created by Natsuki Munakata and Shingo Saito of Japan. 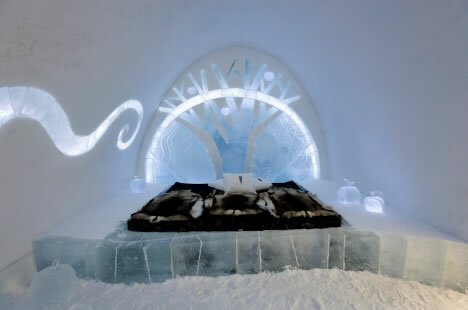 “The Queen of Ice” is the fourth ICEHOTEL suite that the dynamic duo has created together. This artist suite is called “Here There.” Inside there is outside here and outside there is inside here. It’s only a night of deep sleep that can put the there and the here in the now. 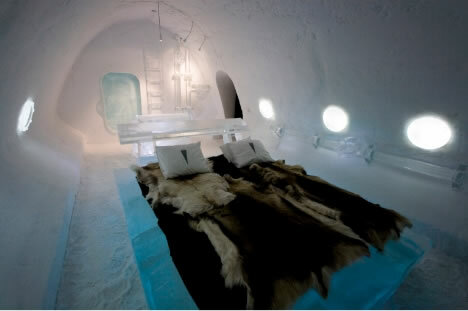 It is the second ICEHOTEL suite designed by Leo Park and Finn Öhlund of Sweden.